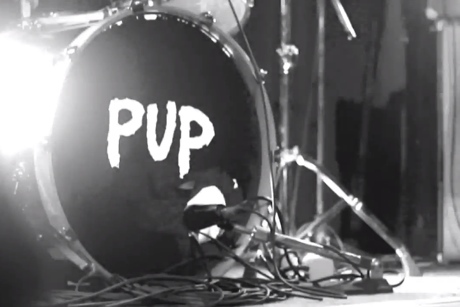 Punk-y Toronto pop-rock band PUP recently shared their cover of Jay Reatard's "My Shadow," and now they've given it an accompanying video. The rowdy performance clip shows the band performing the song live, and we see black and white footage of the four-piece kicking up a racket during a packed, sweaty gig. Most of it is filmed in extreme close-up, so it can be a little disorienting, which is by no means a bad thing. Fans of the band's self-titled album from 2013 will likely find a lot to love here. As previously reported, PUP are heading out on tour with '90s alt-rock obsessives Solids. You can see all the dates below.